Json is the de-facto format for semi-structured data storage and interchange. The basic data types in Json are number, string, boolean, object and array. Objects and arrays allow you to have nested data structures. This makes json ideal for storing any data structure, but also requires extra work to handle. MongoDB documents are read as Json objects. Many Rest API sources also return json objects, arrays or line-delimited Jsons. Xplenty allows you to process Json objects and extract data from them in various ways. 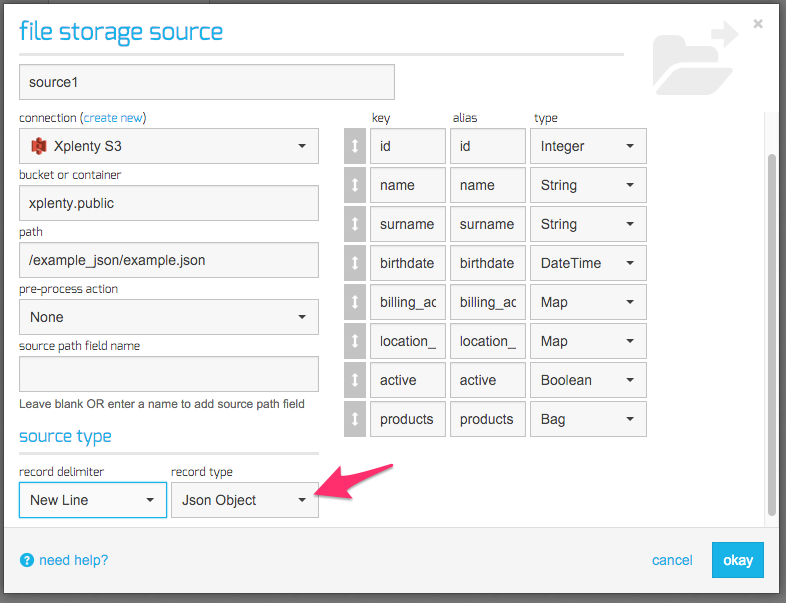 When loading Json data from files, simply select the Json record type and click the auto-detect schema button. Xplenty automatically detects fields at the first level of the json hierarchy. Complex types such as Json objects or arrays are automatically transformed into Xplenty’s complex data types - map and bag respectively, which allows you to easily work with these fields as you will see below. 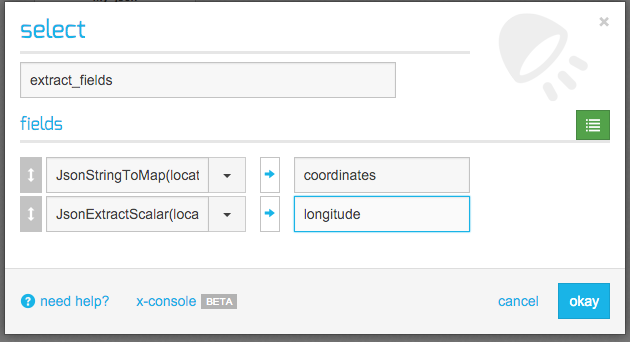 Xplenty also allows you to use JsonPath to traverse Json objects in a dynamic fashion. In some cases, you may prefer to use JsonPath to extract data from nested objects and arrays at the first level of the hierarchy. To do this, change the data type at the source from map or bag to string. Generally speaking, you should transform a Json object to a map if you’re extracting multiple fields from it. Use JsonExtractScalar if you are only extracting a single field or a deeply nested field. Json arrays at the first level of the hierarchy are transformed to bags. Bags are collections of data items which you can either transform to bag functions or flatten out to items using the Flatten operator, so that each item in the array becomes a separate record. The JsonExtract* functions fail if the first argument is not a valid Json. JsonStringToMap and JsonStringToBag are less stringent and simply return null if the argument is not a valid Json. Apply the appropriate function to a string and compare to null in a Filter component or in a CASE statement (within a Select component) in order to check if a field is a valid Json. returns ‘not valid’ (because it’s not a json array).